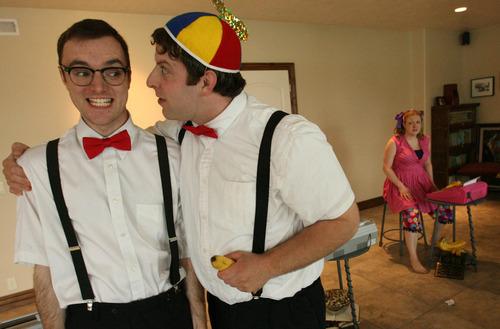 Newly-founded Hive Theatre Company generating buzz. Jared and Tiffany Greathouse are partners in just about everything. The South Salt Lake couple, who met at West Jordan High School as part of a theater group there, has been married for seven years. Now just in their mid- to late-20s, they are co-founders of a new community theater group and co-producing a series of one-act plays set to open Friday. They also are co-directors of the event at a small theater in Sugar House. On top of that, the Greathouses will be performing, as well as designing sets and doing promotions. The plays, each one about 15 minutes in length, also will feature a third actor, Shawn Saunders, a drama friend from high school and a theater major at Utah Valley University in Orem. The production opens Friday at Sugar Space Studio for the Arts in Sugar House, 616 Wilmington Ave. (2200 South), and is set for only two performances; it closes Saturday night. The comedies are collected under the title "Word Play" and were written in 1989 by David Ives, 61, a Chicago native and a well-known, award-winning playwright and young-adult novelist. The three works are entitled "Words, Words, Words," "The Philadelphia" and "Variations on the Death of Trotsky." These short plays "are old favorites of mine for years and years," Jared said. "They are absurd  funny especially  surreal, and they make you think." But there is more to the evening. Poet Karen Christensen will perform, as will a musical group called Dos Dragones, which will offer a mix of funk and bluegrass. 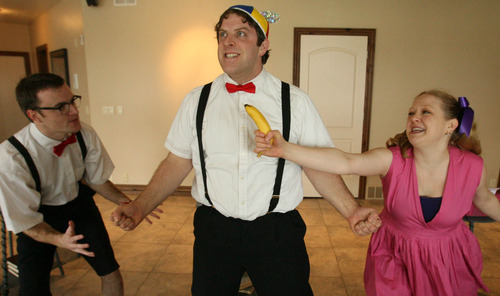 Then the improvisational comedy group, Toy Soup, will perform. "Everyone can find something to enjoy," Tiffany promised. "They'll see something they've likely never seen before." The Hive Theatre Company is very much a shoestring operation that the couple funded by selling equipment from a band they once had called Dacho. In addition to their high school work together, Tiffany has a bachelor's degree in film with an emphasis on acting from the University of Utah; Jared took acting classes at Salt Lake Community College, but said he "learned more" doing theater around the community in such groups as the Hale Centre Theatre, Off Broadway productions, the Grand Theatre at Salt Lake Community College and at the Rose Wagner Performing Arts Center. Said Tiffany: "Then, six months ago, we decided to devote all our energy " to The Hive Theatre Company. Added Jared: "I miss it [the band] sometimes, but I don't miss [playing] in stinky bars." Part of the deal with Sugar Space, Tiffany said, is that the couple won't move their minimal set into the space until just before the Friday performance, then they have to dismantle it because the stage area will be used Saturday for another event. They set up again just prior to Saturday night's performance and dismantle after the show. The arrangement "is as far as our budget goes. This is our fundraiser show, and we hope to build funds for growth," Jared said. So far, in addition to the support of family and friends, the company has two sponsors: Slug Magazine and KRCL (90.9FM). They also have been limited in where they can rehearse for the show. Most rehearsals have been in Jared and Tiffany's living room or in the basement of her parents' house in Draper. "We just sort of move all the furniture out into another room and go for it," Tiffany said. When • Friday and Saturday, 7:30 p.m.